My name is Sophie St. Claire. I love to teach, sew, design, and create great looking jackets. My current passion is making Chanel inspired jackets with creative elements to a signature style of the modern Chanel look. This blog post is my sewing process of this challenging and fun project. I have always wanted to make a bias cut, opposing angles, 'chevron' looking jacket. My first time seeing “a play of stripe” jacket was in Geneva Switzerland, 1995. Years later, I still find myself wanting to explore the Chanel inspired bias cut jacket. The idea of stripe designing is so amazingly creative. To achieve this custom look, it takes a bit more time and effort to map out cut lines. After a quick sketch though, I was able to use serendipitous fabric, buttons and lining fabric finds. Having found the materials, I explored three different yarns that would give the right texturing and accenting for braided trim I was hoping for. 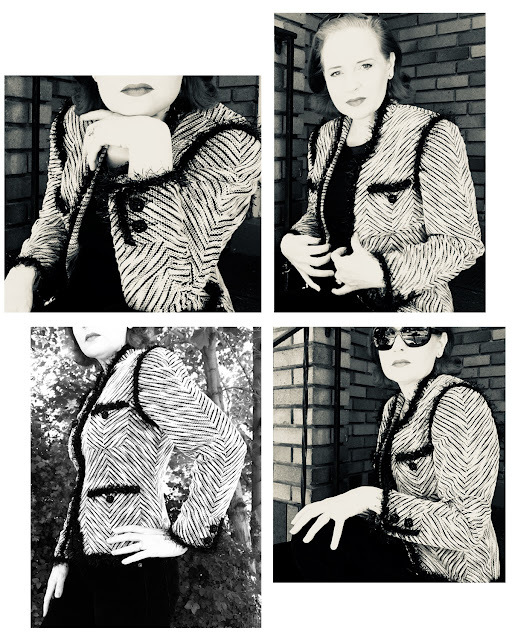 If I am going to dedicate time and energy to sewing a jacket, it’s going to be a wardrobe enhancing, travel-friendly, luxurious, attention-grabbing, fun-to-make piece. This jacket foundation cut is one I make over and over, as a princess line is great for a perfect fit and classic cutline. 1.The first cut is the lightweight woven fusible interfacing on straight of grain. With the interfacing pieces cut out, then I figured out the bias and marked on each interfacing piece with new grain line. The body of the jacket and sleeve cuts were designed for the bias and the collar and facing were on the cross grain. 2. Second part of the cutting process was laying out the straight of grain of the interfacing pieces to the appropriate grain lines. Then, cut out all pattern pieces on the fabric. 3. Cut all lining pieces. No need to figure out too much, here. 4. Be careful to put fusible side to fabric wrong side. Pin for future pressing. 5. Press all the fusible interfacing to all the cut pieces to the jacket. Use lost of steam and pressure to make sure interfacing has fused properly. 6. After the pressed pieces have cooled a bit, pin (as many as possible) all the pieces. Prepping for sewing in one step saves time. Sew all the pinned pieces together and then press all the seams open. Pin all the lining pieces together, sew, press, and set a side for later application. 7. Continuing with the sewing, sew the under seam of the sleeve first. Press open. Pre-prep press the hem at 1 ½ inches, the vent side press and then fold the corner to help with the sewing pressmark for the miter. Once the proper mark for the miter is done then mark with a chalk pencil for sewing line. 8. After sewing the miter trim to ¼ inches seam allowance, soft press open. After turning the miter corner, do a hard press on the right. After tab vent has been pressed and sewn, release the seam allowance on one side to allow tab to lay flat. Don’t cut at the point, but at about 3/8". 9. Now that sleeve hemline is properly sewn, continue with sleeve by sewing a basting stitch at 3/8 seam allowance at 4 mm from ease point to point at the sleeve top. Pull thread to create cupping shape of the crown for prep of sleeve application to armhole. 10. Prep armhole with ½ cotton twill tape. Press-shape with iron steam twill tapes in circular shape and apply at 3/8 with basting stitch all the way around the arms eye. Overlap twill tape at armpit area but not at the seam. Thus reduces bulk and allows for future alteration. 11. Pin sleeve in at points and sew in at regular stitch 3.5 mm. 14. Press the pockets into shape by using a card stock of the pocket shape. (Card stock could be a cereal box). Pulling the corner basting stitch allows the ease of the seam allowance into a perfect corner. The pockets are now ready to pin on jacket. 15. Using a ham, pin pockets into place, securing the placements of the pockets. After pinning, baste. Baste stitch should be about 1/8 of an inch from pocket edge and stitches need to be visible from the wrong side. 16. Now that pockets are secured with basting, sew pockets on with a backstitch on the backside of the pocket at 1/8 from 1/8 basting stitch. 17. After the pockets have been applied do a hard press with the ham to settle pocket stitching on the outside of the jacket. Note: I hadn’t realized until I was placing the pockets, that with the chevron pocket seam matching up the princess seam line, I made the pocket too close to the front zipper edge, so I had to move the pocket over about a half an inch. Luckily the trim hides the not matching pocket design line to the jackets front. Of course, only a very discerning eye would notice the lines not matching. Knowing this I would have moved the princess line seam cut line over a bit. braiding. I repeated thus 4 times and knotted each end for later application. 19. Remove standard zipper head with wire cutters and replace it with new stylized zipper head. 20. Baste zip on right side of fabric at center front with a basting stitch at 5 mm to zipper placement area. Zip zipper and figure its placement on the left side. Make sure zipper zips easily with the tweed fabric (some times you have to put zipper with a little bit more space from the tape to coil). 21. Sew facing to lining with bias trim accent. 22. Sew inner collar to facing and lining, then sew collar to the jacket. Press seams open and de-bulk. The facing is now ready to sew to jacket fronts, neck area and collar. 23. Trim away and press. After the pressing is properly done, then, using large stitches, baste facing down to help preserve shaping for more sewing to the jacket. Baste about 2 inches from center front and collar area. 24. Pin sleeve heads in place, allow extra for the backside of the arms eye. Note: I use batting for sleeve heads, its easy to press into a nice shape and light weight. 25. Sew batting sleeve head in place with backstitch to the seam line of the original sleeve application. 26. Place shoulder pad in the shape of the natural shoulder shape and pin. Tact shoulder pads with light tension with stitches close to original stitch line with secured start and end. 27. Pin armhole lining in place to the seam edge all the way around. Back stitch at 3/8-seam allowance to fabric edge. Allow needle to grab multi layers. 28. Pin lining under sleeve are to armpit right sides together, then find shoulder line placement mark to sleeve head mark, pin in place and continue to pin each side with some gathering to more the ease in place. 30. Use fell stitch to sew sleeve lining to armhole. Allow needle to garb multi layers. 31. Sew buttonholes to tab vent of the sleeve. When sewing buttonholes use cording to help give depth to the visual look of the buttonhole, as well as increasing its structure. 32. Sew buttons to button placements. 33. To finish trim ends use net. Place edge a small piece of net (about ¾ inch square) to trim end, secure by hand, wrap net and turn to back side and secure again. Sew trim on pockets, jacket body and vent. Sew trim on by using a backstitch with catching multi layers, careful not to over grab to under side. 34. Sew chain on with a backstitch about ¼ from hem edge on inside of hem line of the jacket. Secure well start and end of chain. Try and make stitches equal to chain link and go with a rhythm of stitching. For me, there is nothing quite more exciting than wearing a jacket that you made. I love my jackets. People stop me and ask about them when I travel. I feel this style of jacket (Chanel inspired) exudes luxury and class. What’s even better about this new jacket (Chevron) is that I can literally through it in a bag and go.